This quote from Ben Lee, one of Forbes’ top 15 influencers to be following, and award winner of Inc. Magazine’s 30 Under 30 Most Brilliant Young Entrepreneurs of 2016, is becoming more and more true in today’s world of online marketing. SEO, or “search engine optimization”, and content marketing have been compared and contrasted with their level of achieving marketing success for years. 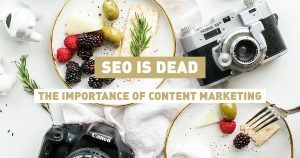 SEO and content marketing are similar in the sense that they both have the same underlying goal of generating more and more traffic to a website. The methods in which this is done, however, is where they differ. SEO is all about rankings and reputation. The higher ranked and the more reputable your webpage, the more it appears in overall search results and the more likely a person will turn into a site visitor and, in turn, a customer. Thus, people using SEO will specifically tailor the content of their webpages to appeal to certain audiences or to what they think a search engines’ expectations and methods are for achieving the highest ranking and the most visibility. This method, however, is beginning to show cracks in its success. People have begun to feel the lack of authenticity in this style of tailored, optimized content. This is where the importance of content comes in. Forbes Magazine defines content marketing as “the idea of creating valuable content for your customers to consume…. content that’s practical, informative, entertaining, or otherwise useful”. At the end of the day, there is a person on the other side of the computer screen that you are trying to engage and convert into a consumer. The best way to reach out is through quality, original, and creative content that your site visitor can’t resist learning more about. This content could be a video, an infographic, a blog post, the list goes on and is specific to your product or service. Whatever the piece of content is, it should act as a source of value to the person consuming it. Your goal with your content should be pure and simple: create something that stirs an emotion, or start a conversation that your readers will become invested in or want to share. Your goal should be garnering an organic visitor following because your content is your own and is high quality. Once that is accomplished, the engagement and success will follow. The investment of time and creative brain power is worth it.